I am dealing with environment simulations, neural networks and fuzzy systems by programming them. The latter is being done under Linux ( since 0.99pl12). Furthermore, I am interested in electronics and in hardware, I am trying to relate that to Linux. This article demonstrates the suitability of Linux-based software in science. The development of scientific tools for the similation of the landscape will be specifically covered. 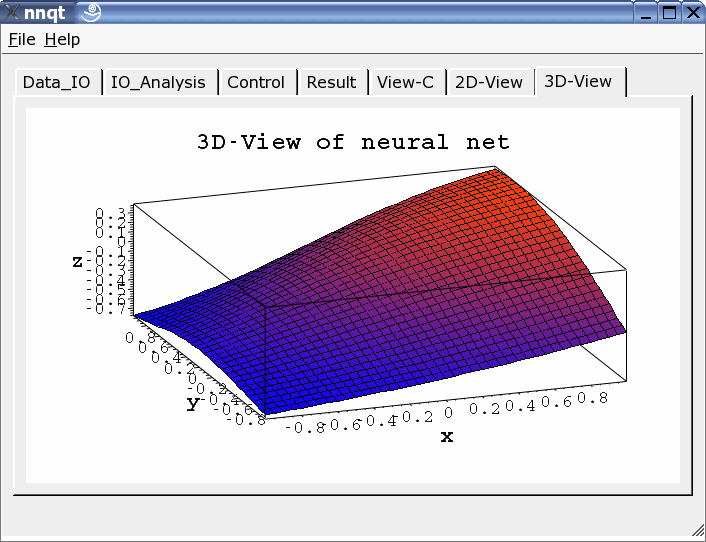 As an example, we will introduce the neural network simulator, which was released under the GPL. Will we be able to drink the water in another 50 years, without restrictions? Which plants and animals will be living here if the climate changes; will there still be forests, and will the farmland be arable ? Where does the dust of the desert fly to, and how do deserts expand ? Each of these questions involves a great deal of research by many scientists. My concern is how Linux may be utilized to answer these questions. In order to clarify this, we have to examine a bit closer how such investigations and analysises are being conducted. Such daunting challenges, as mentioned before, are consisting in general of many subproblems. If one wants to clarify, if the water remains potable, the data for the water need to be researched. Data are available from various sources, agriculture for instance is contributing considerably to water pollution. But how much it actually is, and what gets into the water over which timespan ? To answer that question, each data entry has to be considered. That is elaborate and is afflicted with serious mistakes. Who knows exactly how much is carried by air, through industrial discharge and from agriculture, etc. The data are also associated with precipitation, its drainage and evaporation. Such influencial factors vary with a potential climate change. To be able to investigate the processes, computer simulations are indispensible requirements. 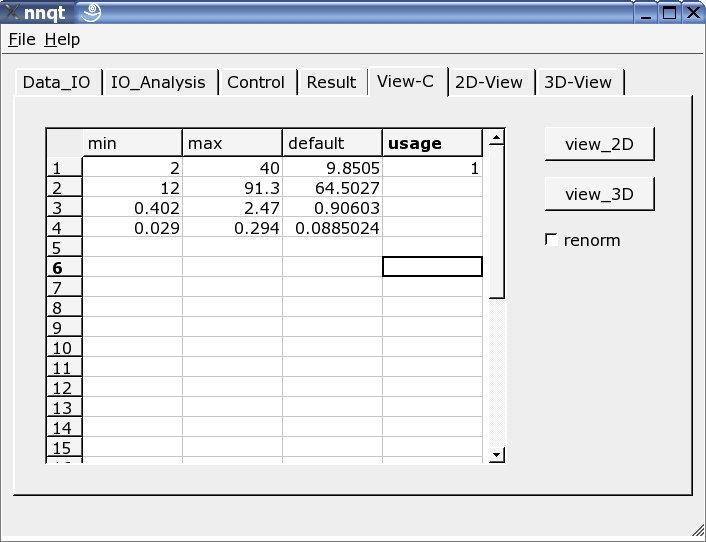 Prior to performing a simulation, a number of constraints, parameters and functions have to be determined. Functions and parameters are extracted from laboratory tests, field tests and observations of real usage. They describe the absorption of fertilizer by plants, degradation processes in the soil, etc. The simulation itself is based on the assumption of case scenarios and is often executed as so called Monte Carlo Simulation. In doing so, the data are being stochastically variegated and the simulation is repeated with different initial conditions. Result is a number data sets with feasible, but different propabilities. These sets have to be analyzed and edited to serve as basis for decision making. Goal of the regional modeling is the preparation for potential changes and to develop strategies today for sustainable land use. We may not be able to predict the future, but we are able to prepare for it. By getting more into the details, we recognize, the work of modeling consists of two subtasks for the scientist. First, the models need to be adapted, data sets need to be analyzed and reports need to be written. The second part is the development of specifically customized software to do the research. The daily legwork, consisting in analyzing of data, bitching about flawed measuring data, reformating of different data formats, writing of reports, etc., benefits tremendously from Linux. Even if some believe Excel and such can do everything, the combination of Perl, Emacs, octave [www.octave.org], R [www.r-project.org] etc. proves to be a strong contender in the battle with the data. Perl is very versatile, not limited to converting data; it queries data bases (MySQL), executes calculations, etc., fast and reproduceable. Specifically the latter is important since manual work frequently leads to mistakes in the data, this is rarely the case with the application of proven scripts. Writing articles with LaTeX convinces through its quality of appearance. Linux provides tools which make it attraktiv for scientific work. We do not want to conceal one disadvantage: one has to be intensely involved in utilizing those tools. Not everything can be done intuitively and not everyone is a programming freak. Why has one to develop everything oneself, isn't it all available? 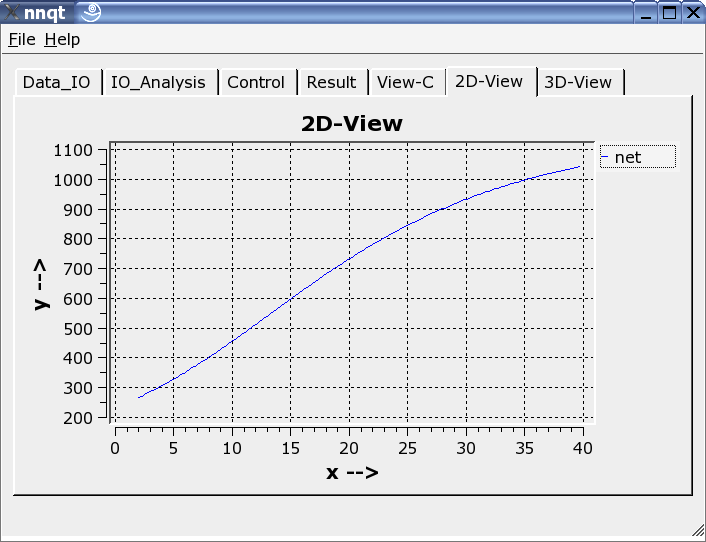 There are high-performance tools available for simulations, like Matlab [www.mathworks.com]. To process geographic data the Geographic Information Systems (GIS) like ARCGIS [www.esri.com/software/arcgis] or the free software Grass [grass.itc.it] are available. For statistics it does not look much different. So, why continuing to develop? The problem is not the performance of the single components but their collaboration in a system. In a simulation, subtasks have to be performed by different programs, which may communicate only cumbersomely, meaning through user-produced interfaces. Aggravating is the fact, that the data available are mass data (spatial data) with high error rates. The essential simulations have to accommodate for this trait. An algorithm has to supply useful results even when the data entered do not fully match, a warning should be given in that case. The processing of mass data (matrices with more then one million elements are the rule) require fast algorithms. Robust and fast algorithms can often be implemented only by developing them by one's own. The significant drawback of commercial systems is the secrecy of the source codes. How can scientists develop and exchange models if the sources are not open? From this conclusion it was decided to develop a "Spatial Analysis and Modeling Tool" (SAMT) as open source software. It is a simulation tool, incorporating data management for spatial data, interfaces to the MySQL data base and to GIS. It contains fundamental functions for the management of raster based data, it is able to manipulate rasters (blending, distances, interpolation, etc.) and is able to generate a two dimensional or three dimensional presentation of the data. Note: raster data are based on dividing a map into a small-square grid. The information is stored in several layers of raster data. A model accesses the information of the layers. Besides approaching the information in the depth, the surrounding information on the same level are fundamental. The latter are the basis for the modeling of lateral material flows, as they occur in soil erosion, caused by wind and water. SAMT generates the framework into which the tools - like a (very fast) fuzzy interpreter and the neural network tool (nnqt) - may be adapted to. Fuzzy models serve to integrate expert knowledge into the simulation. An expert can often describe a process or even control it, even if no mathematical model is available. Neural netsworks are processes which allow us to derive functional correlations from measuring data. 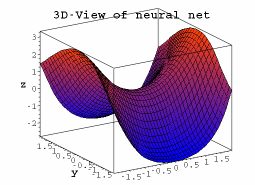 The following shall introduce the development of the neural network tool. A artificial neural network consists of several layers. The first layer will be loaded with the initial data to be trained, in the form of floating-point numbers. The layer between input and output is not directly visible to the outside, it is called 'hidden layer'. Sometimes several hidden layers are present. The output layer of the example is only one element. This kind of architecture is used to build one function from several inputs and one output. The hidden layers are necessary to map non-linear behavior, for example the function x^2-y^2. How does a net know the wanted function? Initially, of course, the net does not know the function. The connections (weightings) between the elements (nodes) are attributed with stochastic values. During the training process the learnig algorithm tries to change the weightings in such a way that the mean square error between the computed and a predetermined output reaches a minimum. There are a variety of algorithms to accomplish this with, we are not going to elaborate on them here. 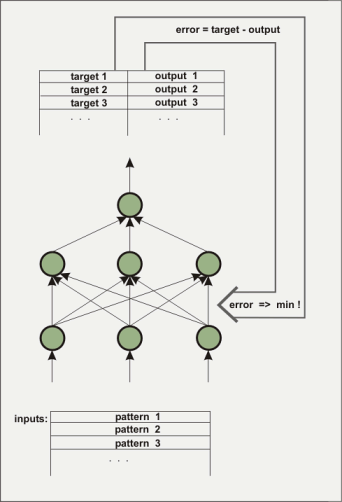 Three algorithms were implemented into nnqt. Contingent on the input for the designated output, this process is also called 'supervised learning'. The net is trained to detect if it has reached a small enough error with the training data as well as the control data (it is advisable to separate part of the data prior to the training to use them as control data to verify the lerning performance). The weightings determine the behaviour of the net and they are being stored for that purpose. What is one able to accomplish with such a net? In addition to the application as modeling tool in science there are a number of more or less serious applications. There are attempts to predict the trends of the stock market. I was not successful with this, but maybe someone else will do it. Another interesting possibility would be the use of a neural network for shorttime weatherforcasting. The data of electronic weatherstations, for instance, could be used to train a neural network. Useful would be the atmospheric pressure and its changes, as well as the precipitation. The symbols on the weatherstations follow these pattern. A neural net may do it possibly better? To support one`s own experimentation nnqt is available as GPL-software. There is an overwhelming amount of good literature on neural nets. As representative for most of it one book may be mentioned. However, sometimes there is a gap which has to be closed through one's own experimentation or by exchanges with others. I liked the fast work with Matlab using the application of the Levenberg-Marquardt-algorithm. Only after extensive internet searches did I find an articel [www.eng.auburn.edu/~wilambm/pap/2001/FastConv_IJCNN01.PDF][local copy, 105533 bytes] which describes this algorithm's use for neural networks. That was the base. I had "only" the task to integrate my favored tanh (tangens hyperbolicus) functions into the algorithm. Also, for this I used Linux software: the computer algebra system Maxima [maxima.sourceforge.net]. It is possible with this kind of system to manipulate complicated equations, to diffentiate and so on, operations which are not so simple to solve with paper and pencil. 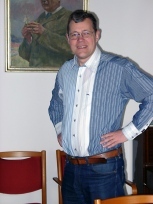 Maxima made it possible to perform the required manipulations and to implement the first version of the algorithm in C in a one-weekend session. The C-implementation was done for testing and to tweak the parameters. By utilizing the open source simulation system desire [members.aol.com/gatmkorn] (many thanks to the developer Prof. Korn!) 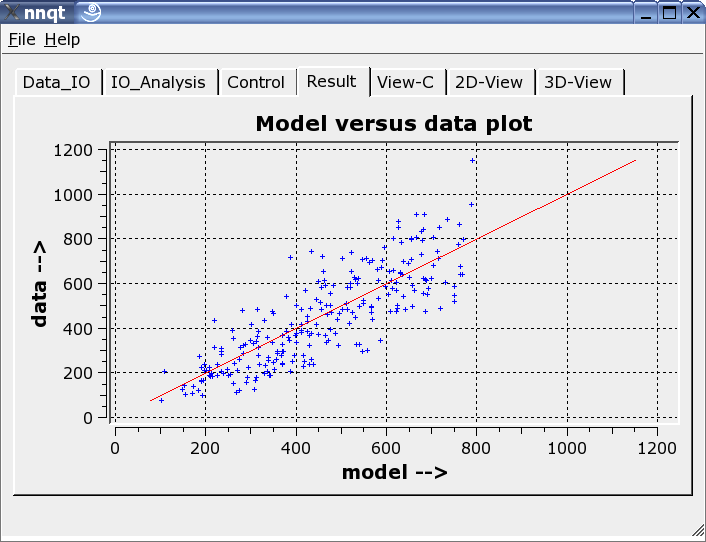 as a tool for comparison, initial model computations could be executed. The newly implemented algorithm did not do too bad. The training time for the xor problem, a favored test example for neural networks, achieved an average of 70ms on a 3GHz Pentium computer. ( Much of this time is being used by the reading operation of the harddrive, the time on older Athlon 750MHz computers was slightly higher). As an alternative, the well known back propagation algorithm was implemented and analyzed. After these preparations, which are the basis for further improvements of the algorithms, the implementation of the toolbox continued. 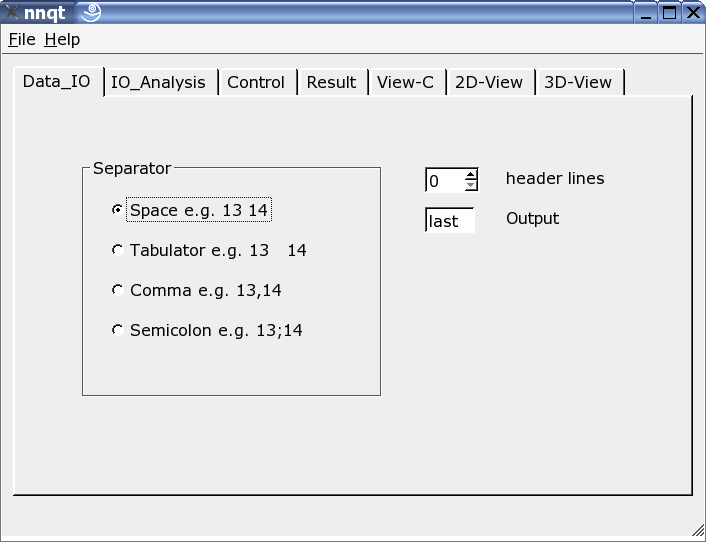 Here the reader can be adjusted to the input data format. Various separators may be used, some header lines may be hidden or the target in the data set may be freely chosen. Note: the data format should be known, since nnqt depends on the user input. This shows the comparison of the trainings data with the data generated by the neural network. Ideally the data should be on the diagonal. But the ideal cannot be achieved! Nevertheless, the results look fairly decent. (The control data - they are the data which were not trained - are shown in red.) 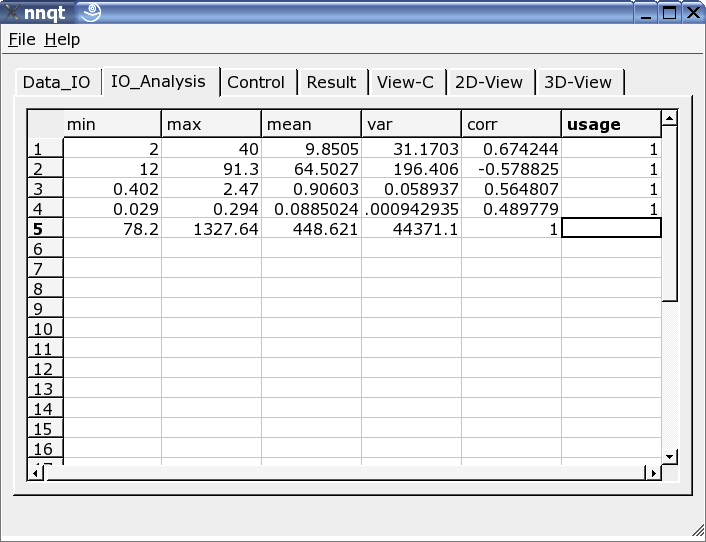 The next step allows the analysis of the function progression. The default values have to be set to meaningful numbers. With this we have to be careful, since the network's work reliably only close to the training data. Two-dimensional or three-dimensional presentation may be chosen. What could we create with all this - I am anxious to see your ideas. It has been demonstrated, that Linux is an excellent development environment to solve scientific problems. I was able to do the development on the basis of excellent software, without that, it would have been impossible to create a usable tool in the short timespan of 6 weeks. It is always pleasant to be able to use free software. For this, many thanks to the many developers whose work made all the wonderful things possible we may do under Linux.